Imagine a place where everyone shares your passion for pets, and your love of doing a great job. Imagine the close collaboration you'd experience, and the outstanding results you'd produce. Now stop imagining - because such a place exists, and it's right here in our Phoenix home office. Everyone who works in our home offices in the U.S. and Canada has taken our mission statement – for the love of pets – to heart. After all, every decision we make directly impacts the lives of pets far and wide, so it's no surprise that they feature pretty high on the agenda. We’ve even created a pet-friendly campus – meaning you'll often be sharing office space with some of the cutest and most inspirational creatures around. 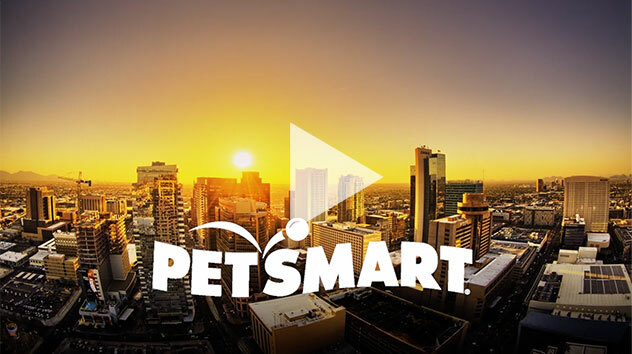 We’re sure you’ll agree that corporate careers really don’t get much better than with PetSmart. Beautiful sunshine. The great outdoors. World-class attractions. What's not to love? As the fifth-largest metropolitan area in the United States, Phoenix has a lot to offer. With nearly 300 days of sun and an average yearly temperature of 72.6 degrees, Phoenix is an ideal home for nature lovers, active families, and sports enthusiasts. Living here means you’ll enjoy a wide range of unique restaurants, world-class shopping destinations, nightlife options, and much more. Don’t forget to check out nearby attractions and make any weekend a getaway. What I love about PetSmart is that you don’t just come to an office, you come to a community in a lot of ways. We all share that fundamental passion for pets and it really brings us together. Just like we are proud to serve all types of pets, we are proud of all the diverse people who work with us. Our internal associate resource groups help us highlight different perspectives and help everyone to feel welcome at PetSmart. PetSmart values growth and career development of our associates. We offer a variety of robust training opportunities – including self-paced learning, instructor-led sessions, and on-the-the job development activities. Associates are encouraged to partner with their leader to create individual development plans tailored to specific career goals that allow them to reach their highest potential!